There are few styles that are as perennially in fashion as the breezy, cheerful beach style. You can pick up any era or decorating period of the past and you will see the style always high on the decorating trends list. Its simplicity, its beauty and mankind’s endless love for all things nautical seem to drive the timeless popularity of this style. 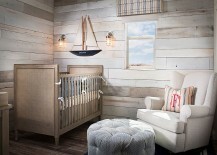 Whether you prefer its nautical side, coastal hues or a blend of both, today’s post will definitely put a smile on your face as we take these beachy influences into the modern nursery. We start off with a nursery that uses the classic colors of the nautical theme: red, white and blue. But this space tones down the red and employs it frugally, even as blue and white take over the setting. Additions such as the paddle on the wall, throw pillows with nautical motifs, a window bench and a fabulous floor lamp drive home the curated nautical look. Even though it moves away from the beach and onto the high waves, it still reminds us of the magic of life on the coast! 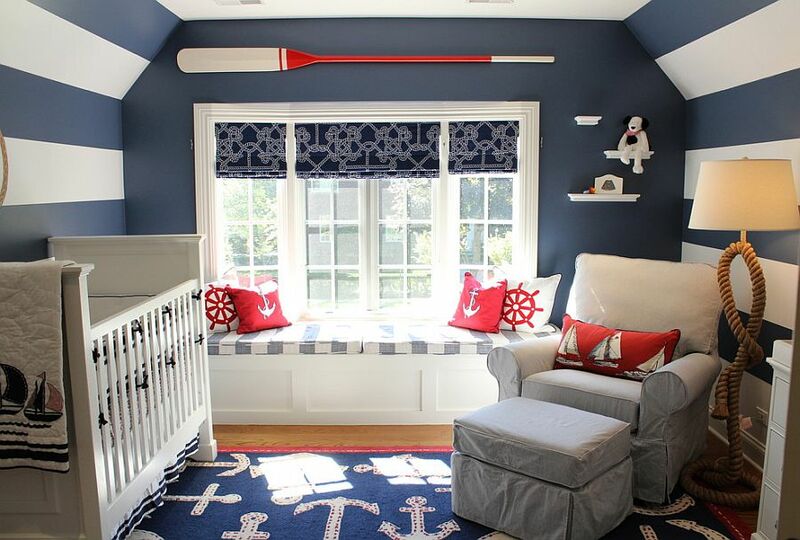 This cleverly designed nursery sure seems beachy, and yet by simply changing out a few of the details you can completely alter its style. We absolutely adore rooms that give you an ability to switch between themes and styles with ease, as they allow you to redecorate with changing times and trends without making major changes. 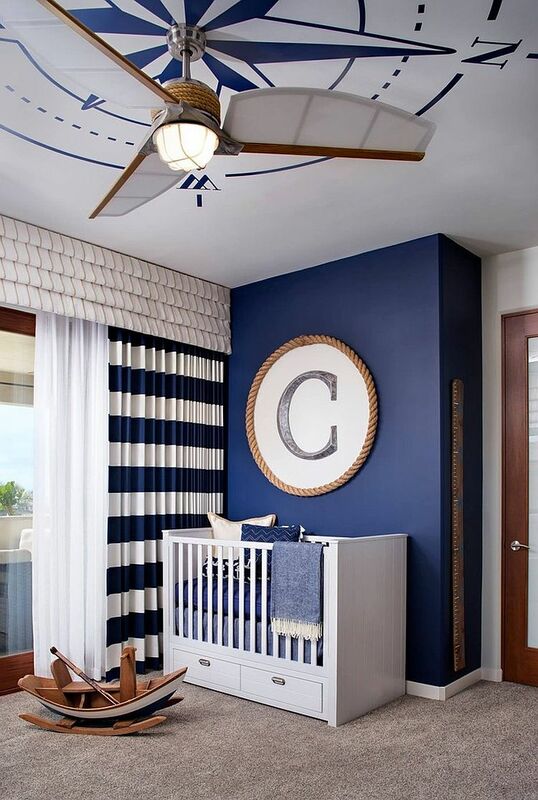 Not splurging on dedicated themes in the kids’ rooms is a smart idea, and it is the bold blue drapes, rug and a few wall decorations that give this room its beach style. But the blank backdrop remains untouched! 3. Inspired by the Beach! 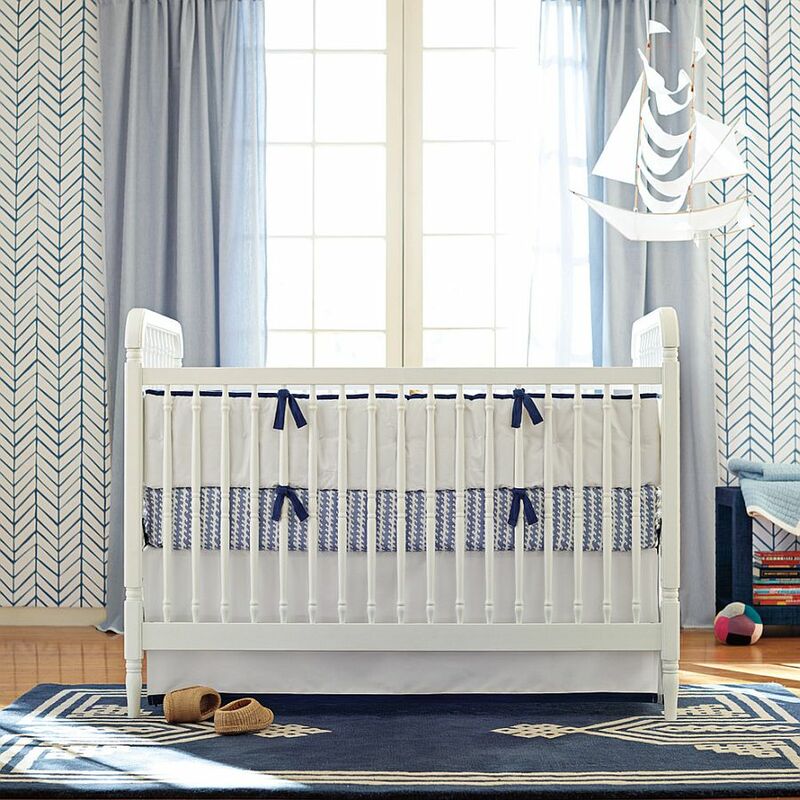 When we talk about drawing inspiration for the nursery from sand and surf, most homeowners tend to gravitate towards the surf part. 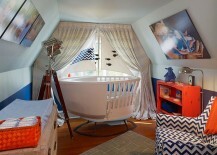 It is an understandable attraction, as colors like blue and red seem far more attractive in the context of a nursery. 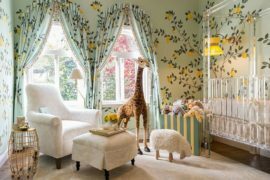 But this nursery draws its inspiration from the sandy beaches, and its varying shades as a subtle tone-on-tone approach and its use of natural materials creates a relaxing atmosphere. If you feel it is too dull, you can always add a couple of bright accent hues easily. 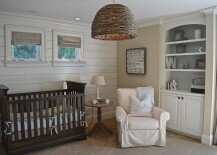 Another nursery where white seems to be the star of the show! 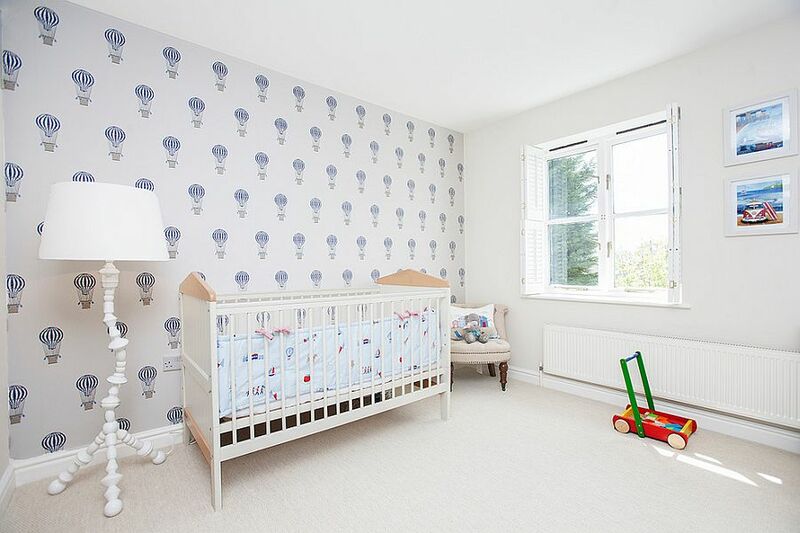 But look closer and you will notice how with a simple roll of wallpaper, one can turn a plain white room into a beautiful and elegant nursery. The BorasTapeter’s Children’s Wallpaper with air balloon motif does the trick here. A couple of framed photos of your favorite beach holiday and a hint of light blue here and there can complete the look. It’s a decorating style that is simple, effective and easy to replicate. 5. Create Your Own Style! 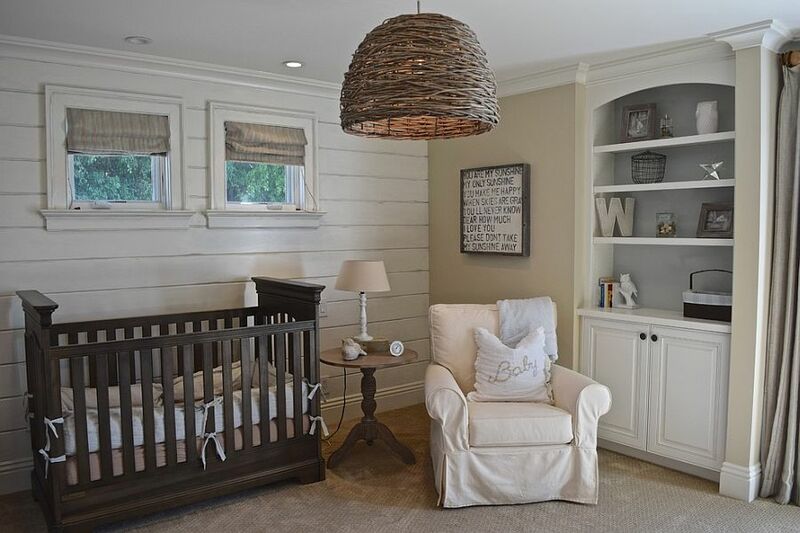 We love this nursery for its understated class, perfect interpretation of beach style in a modern context, and the ease with which it uses décor from the likes of Pottery Barn Kids and Restoration Hardware in such an effective fashion. 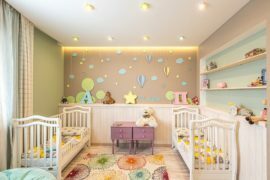 The custom walls with wooden paneling add to the charm of the nursery, and lighting elevates it to a whole new level… A space that epitomizes sophistication draped in complete comfort! 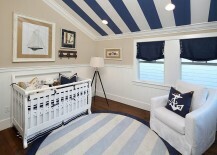 A nautical compass painted onto the ceiling, fabulous blue drapes that add color and class, and a backdrop that is perfect for your little captain at home; it is hard to imagine a nautical nursery that is more inspiring than this. 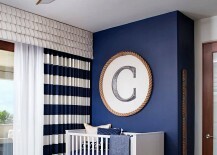 The bright navy blue backdrop will surely keep your kid interested, even as all the white makes the room a pleasant modern space. 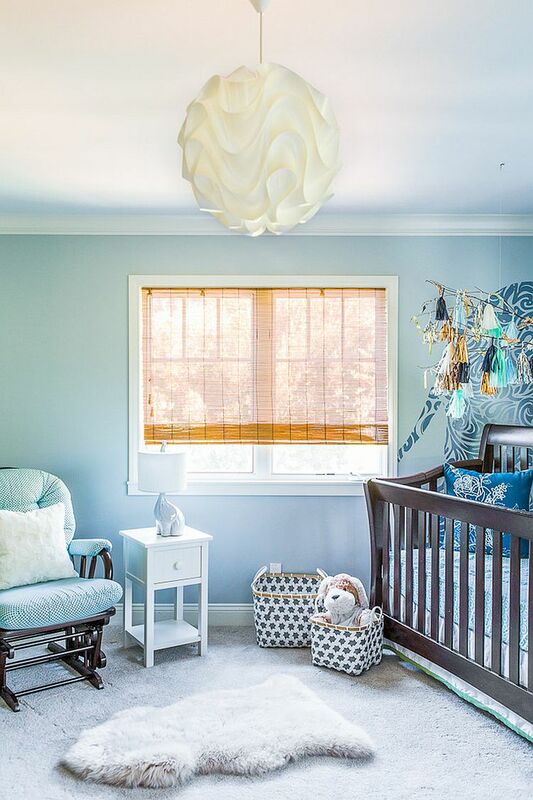 With an animal print in the backdrop and loads of light blue, this nursery moves away from the often-used motifs, patterns and accessories of coastal and nautical themes. 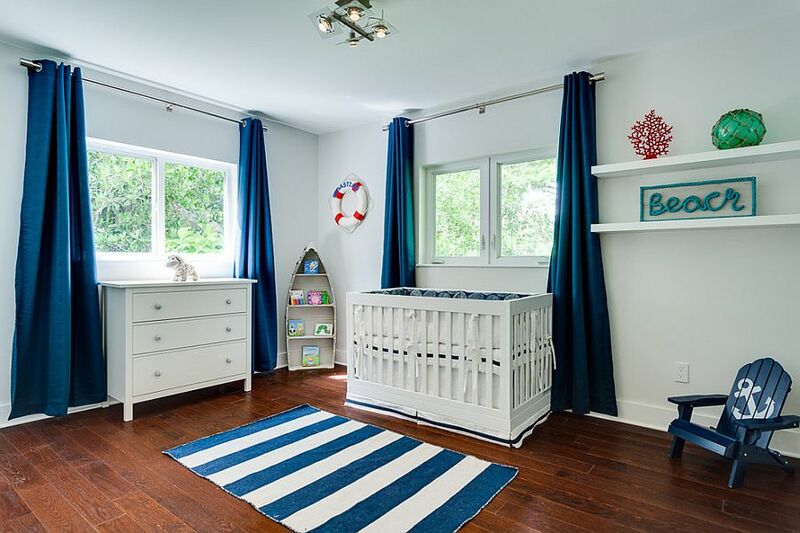 Its beachy quality comes from the ample natural light that floods into the room, the perfect use of various shades of blue, and its pleasant ambiance. This is the beach style reinterpreted with a contemporary, feminine twist! Time to raise the style quotient of your room by going beyond the walls and making use of that blank ceiling. 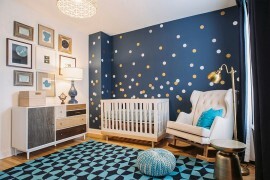 In fact, the nursery is one room in your home where an attractive and colorful ceiling is more important than the walls! 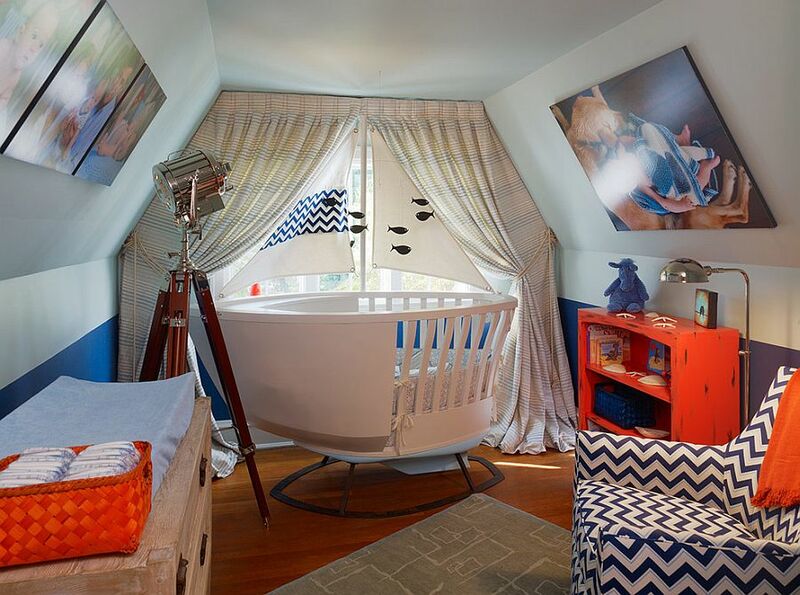 Think about it: how much time does your baby spend staring at the ceiling? 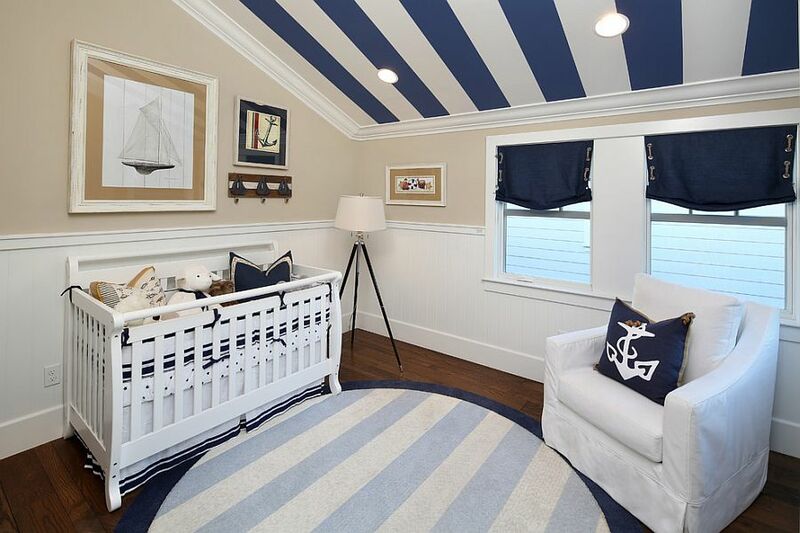 This nursery uses tried and tested blue and white stripes to enliven the ceiling while freeing up the walls for other decorative pieces and artwork. A hint of chevron goodness, clean, straight lines and the subtle use of accessories and decorative pieces that evoke the images of life on the beach – this is what alchemy of contemporary and coastal evokes. 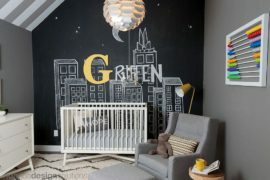 The result is still tantalizingly fun, and you can tune up or tune down the beach style of the nursery by simply changing the décor in the room. 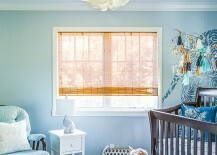 Orange is one of the hottest hues in nursery design, and even when used in a limited fashion it can bring sprightly charm to the nursery. It is a great color that works brilliantly in the small nursery when used judiciously. And on top of it all, orange and blue make a smart and stylish color combination!